It’s not all about the location when you’re shooting a movie but having a good one certainly helps. And, over the course of this issue, we’ve got plenty of film projects that make the best use of some premium spots around the planet. Our cover story focuses on a filmmaker who has spent a great deal of time in Brazil and it’s a fascinating insight into shooting footage in and around the favela’s there. Elsewhere, we’ve also got a feature that uses New Zealand as its backdrop. The film itself is a western and the other-worldly feel of that location works to great effect. However, not all of us can or even want to shoot in the great outdoors and so we’ve got plenty of projects that have been filmed much closer to home and in much humbler surroundings. 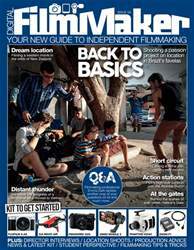 Then, of course, we’ve got the usual sections including plenty of new kit offerings and another six pages of top quality help and advice from Emma Dark and her Ask the Filmmaker column.